As a reputable website, TheSignChef.com promises secure online shopping. 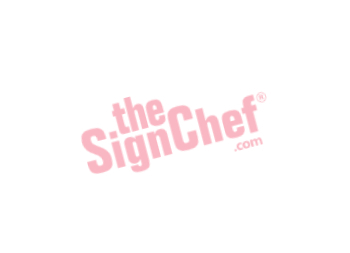 As a reputable website, TheSignChef.com promises secure online shopping. We guarantee that you’ll never have to worry about credit card security when you purchase our products and services online. Our system uses the latest 256-bit encryption Secure Sockets Layer (SSL) technology—the same strength encryption technology used by Microsoft, Walmart and Amazon. It's the best software available today for secure online commerce transactions. It works by encrypting all your personal information (name, mailing address, credit card number, etc.) so it cannot be read as it travels the Internet. After thousands of online transactions, none of our customers have ever reported fraudulent use of their credit card as a result of purchases made online with our company. If there is a problem with any online purchase, your credit card provider will remove that purchase from your statement. By law, they cannot hold you responsible for more than $50.00 of unauthorized spending on your card. Placing an online order through our secure server is much safer than placing a telephone order over a cordless or cellular phone. Anyone with an inexpensive scanner from any electronics store can monitor your conversation. If you prefer to use the phone, please use a landline phone. If you suspect unauthorized use of your credit card has occurred as a result of your online purchase with us, please notify your credit card provider in accordance with its reporting rules and procedures. If your credit card provider determines that you are the victim of fraud but does not waive the $50.00 liability for unauthorized charges, we will cover the liability for you. When you go to check-out, you will notice that the Internet address of the webpage begins with "https." The "s" in the address means that our secure server has asked your computer's Web browser software to encrypt all personal information with 256-bit encryption technology before transmission. At TheSignChef.com, we have several security measures in place to protect the loss, misuse, and alteration of the information we control. These measures include password protection, encryption and our off-line database, which is not accessible via the Internet. We also conduct pre-hire criminal background checks on ALL our employees. If you have any questions or suggestions about this security guarantee, the practices of our website or your dealings on this website, please feel free to contact service@thesignchef.com.